During the week of Holy Week we will be posting daily devotionals to help you focus your heart during this time. 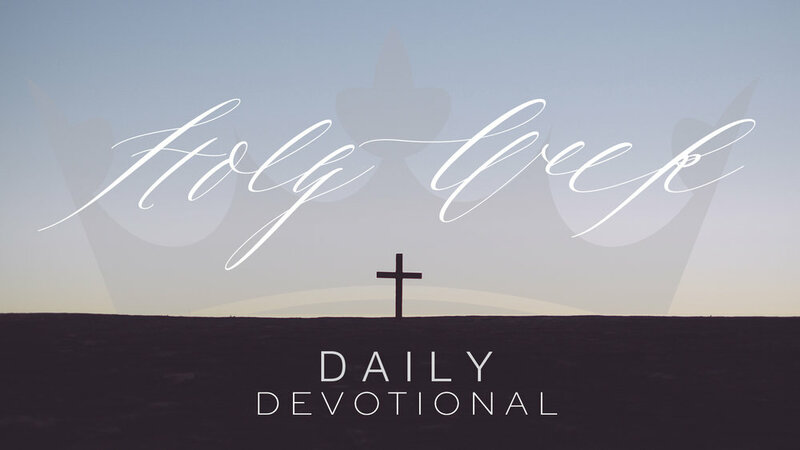 The devotionals will be posted each day on our website, and links to each devotional can be found below as they're posted. Despite the events of Good Friday, the next day would have still been a sabbath. Scripture doesn’t say much about what happened on the Saturday in between Good Friday and Resurrection Sunday. But we see one group rest, and another group not. What does this reveal to us? On Friday of Holy Week Christ not only endured pain and suffering, but He endured the wrath of God…the very wrath reserved for, and deserved by, you and me. That’s what made it a Good Friday. On Thursday of Holy Week Jesus fellowshipped with the disciples at the Last Supper only to be abandoned and betrayed by them all in the garden. Looking to Jesus’s words in these moments we understand the importance of communion, and how to pray in our lowest hour. The middle of Holy Week looked no different than any other moment in Christ’s ministry up to this point. Despite the cross looming, Jesus continues to teach. What can we learn from this example set by our Lord? On Tuesday of Holy Week the Sadducees, looking to thwart the mission of Christ, attempt to stump Him theologically. The theological issue? Resurrection. Christ challenges their beliefs on Tuesday, and will prove His words on Sunday. On Monday of Holy Week Jesus cleansed the temple and cursed the barren fig tree. What can we learn from these two actions? On Palm Sunday Jesus rode into Jerusalem to shouts of praise knowing full well those shouts of praise would be replaced with shouts to crucify Him.